This weekend was Walk London, two days of free guided walks throughout the city. If you didn't get out and about this time, the event runs again on 26-27 September; while next weekend is Story of London's turn to go pedestrian. You don't have to wait for these special occasions to stride out with a guide though. Many of those involved run walks regularly throughout the year: the Walk London site has lots of information while Time Out, IanVisits' events calendar and the City of London information centre are all good places to find listings. 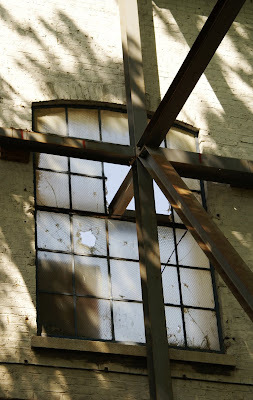 Here's some inspiration: images taken on a guided walk through the City yesterday afternoon. With the Story of London month about to start, here are some of its free exhibitions with a history focus. City Hall includes two which should be worth a look. London Through a Lens is a selection of photographs from the Hutton Archive. It's not clear from the information currently online, but if this is the exhibition previously at the Getty Images Gallery (and in the Time Out book of the same name) then it's well worth a look. In the lobby is Port of London Authority - a century of service. Here in Deptford there will also be a photographic exhibition, by twelve young volunteers who are photographing 36 heritage sites in the Borough. A booklet will be produced to accompany it. For art history, try The Whitechapel Boys at the recently-reopened Whitechapel Gallery. This group of Jewish artists and writers met at the Whitechapel Library at the beginning of the twentieth century. Educational history is covered by Images and Documents from Chelsea and Queen Elizabeth Colleges, 1895-1985 at King's College London. Finally, if you're not Henry VIII-ed out yet, visit the Richmond Museum for Henry and his father Henry VII in Richmond, or the Honeywood Museum in Sutton for Henry VIII and Nicholas Carew of Beddington - from friendship to execution. These are just a small selection of the exhibitions available: for a full list including those with admission fees, art, and contemporary London life, visit the Story of London events pages. 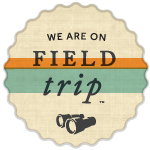 For a selection of the most interesting events, see the IanVisits events calendar. With just a few days until it starts, the programme for Story of London next month has now been released. 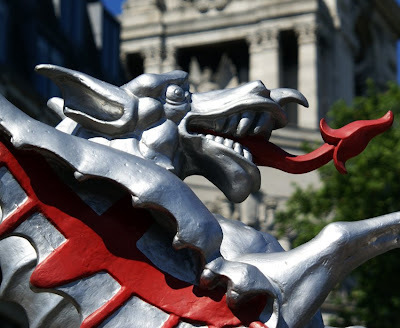 Click here to start exploring London history! 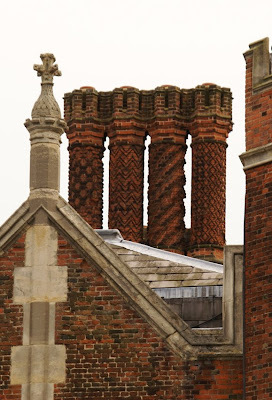 These chimneys were an integral part of the palace's design - although many are now Victorian replicas, since the soft red brick is vulnerable to weathering. Indeed, conservation is ongoing (read about it in detail here [PDF]). 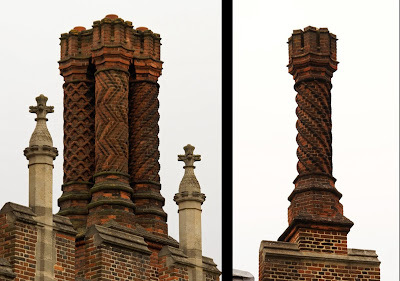 Why were chimneys so important to the Tudors? They were a response to the increasing use of coal, which creates more smoke than wood. The fanciness of these examples was a way of showing Cardinal Wolsey's, and later Henry VIII's, wealth. 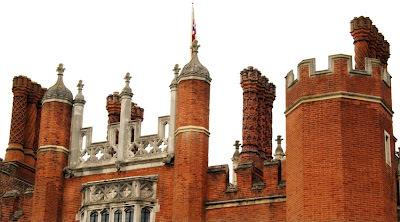 Spiralling and fluted designs also kept them cooler - important given the limitations of tudor bricks. 150 years ago today, the bell Big Ben was taken from the Whitechapel Bell Foundry to the Houses of Parliament. It was in a carriage drawn by sixteen white horses, and travelled across London Bridge, along the south bank of the Thames and back over Westminster Bridge to finish its journey in New Palace Yard. 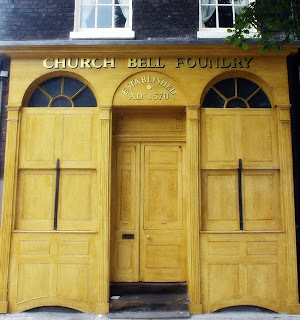 Whitechapel Bell Foundry is fascinating in its own right: it is Britain's oldest manufacturing business, established in 1420* and making bells ever since. The current site has been the foundry's home since 1670 - before that, it was on the other side of Whitechapel Road. It makes church bells and hand bells, while other famous creations include the Liberty Bell which was shipped to Philadelphia and famously cracked when first rung. Although production switched to shell casings during World War II, the bell business resumed with the peace and the foundry was kept busy replacing bells damaged or destroyed during the war. Big Ben is of course the foundry's best-known creation. Barrister Edmund Becket Denison, who also knew a great deal about clocks and fancied himself an expert on bells, was closely involved in the tendering process and specified a bell of 14 tons, made to his own design and bellmetal recipe. The largest bell in existence at the time was just under 11 tons, so this was a somewhat challenging commission - originally taken up by another company. However, in an effort to get the best tone, Denison used larger and larger clappers until the bell cracked during testing with a 660kg clapper. Denison, however, blamed the original casting and Whitechapel took over the project - sensibly specifying that a clapper no larger than 203kg was to be used. The metal from the first bell was melted down and poured into a heated mould, where it took twenty days to cool. Once completed, it was taken to Parliament on 28 May 1859. The bell rang for the first time 3 days later. However, the drama was by no means over. 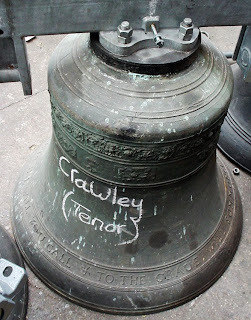 Denison once more installed an extremely heavy hammer, and as a result the bell cracked after two months. Sir George Airy, the Astronomer Royal, came up with a solution: the bell was turned so that the hammer struck sound metal, and a lighter hammer was installed. 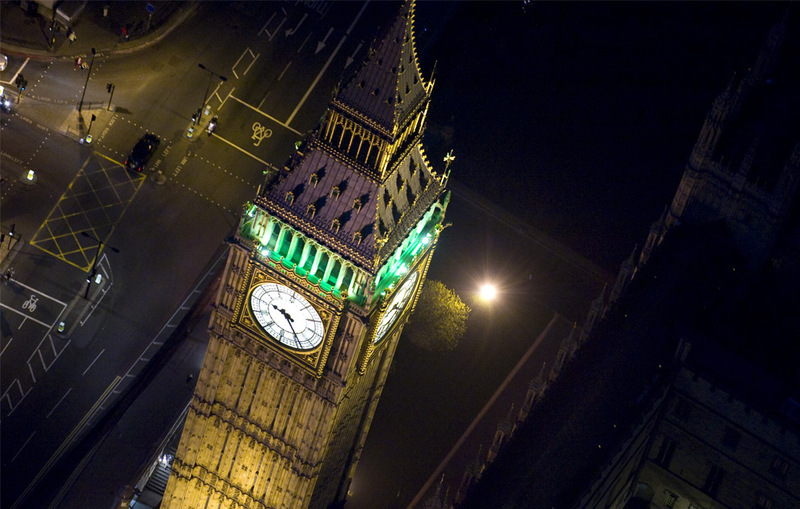 The crack is what gives Big Ben its distinctive tone. Denison did not want to admit his own fault in the damage to Big Ben. When he claimed that the crack was due to poor casting, the foundry took him to court and he lost his case - and lost another twenty years later when he repeated the allegation in print. But let's end - literally - on a happier note: the distinctive tones of Big Ben can be downloaded as a free ringtone here. * Sharp-eyed readers may notice that the Foundry's entrance gives the date as 1570 - that date also appears in the Guinness Book of Records and is early enough to give the Foundry its unique status. 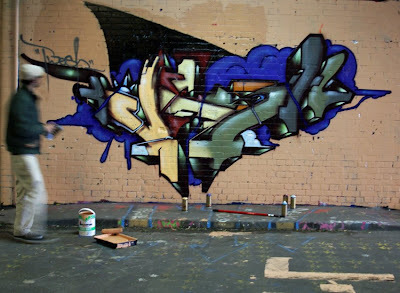 However, subsequent research has established the earlier date. 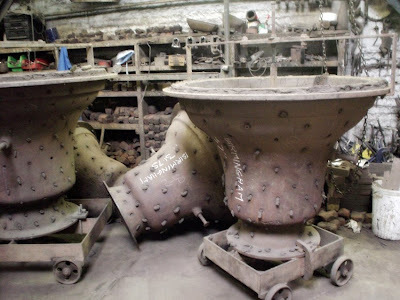 I took these photos during a tour of Whitechapel Bell Foundry: more details of the tours here. 3.15: Performance of Heroes of Ev'ry Day Life - the first in 100 years. This song about the heroes by George Horncastle and Felix McGlennon will be performed by baritone Alexander Knox. Just a very quick post today, to share this link to some amazing photographs of London from the air, at night. No view of Deptford, but there is one of the Isle of Dogs just across the river. 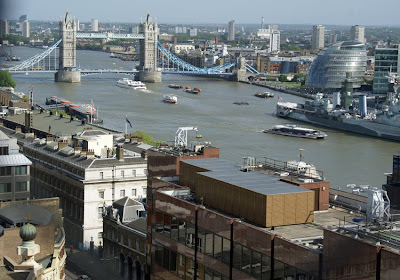 However, the same photographer, Jason Hawkes, does have these aerial views of Deptford and Greenwich by day. Walking behind the Thames riverfront at Deptford, it's hard to resist peering through fences at an empty shell of a building with elegantly curved windows. It is Paynes Wharf, awaiting redevelopment as part of the now-delayed Paynes & Borthwick scheme. Paynes Wharf was built in 1860 as a boiler workshop by prominent local company John Penn & Sons, marine engineers. 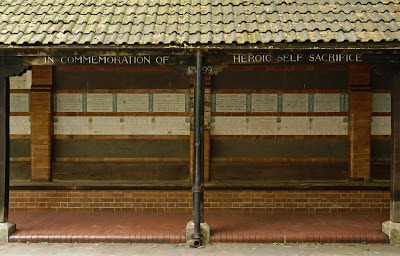 Dews's History of Deptford (1883) comments that 'in connection with these works is an Accident and Burial Fund, which provides - for a small monthly subscription - weekly relief in cases of accident, and a sum for burial in event of death of either a member or member's wife.' Penn's played a leading role in shipping's move from sail to steam. Among the ships for which they supplied engines and boilers was HMS Warrior, the first iron warship, now preserved in Portsmouth Historic Dockyard. The Wharf's facade is Grade II listed, hence its incorporation into the new scheme. 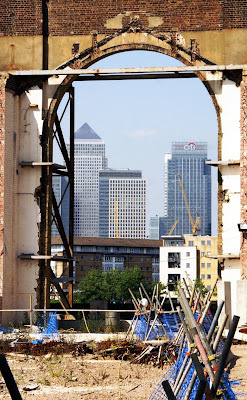 (Neighbouring Borthwick Wharf, a former cold store, has been demolished.) The Italianate arches along its facade had a practical purpose: they allowed boilers to be lifted in and out of the building onto vessels on the river. Incidentally, they also made the building one of the more elegant along the working Thames - hard as that might be to imagine at the moment. These two wharves, along with the Master Shipwright's House, were proud reminders of Deptford's dockyard past and the Creekside Forum campaigned hard for their retention. However, one is gone; the remaining wharf stands as a forlorn shell, in limbo while the developers delay the project because of the current financial situation. Thus the waterfront has suffered the worst of both worlds: pieces of its history gone, but nothing yet replacing them. Thankfully, the Master Shipwright's House is in a much happier condition, an exception to the otherwise depressing state of the waterfront. Along with symbols of death, Victorian cemeteries such as Nunhead are rich with references to eternal life. Even the downturned torch includes this: while it alludes to life being snuffed out, in fact the flame still burns. Less ambiguous symbols include the circle, as a shape without beginning or end. It often appears in the form of an wreath, with evergreen foliage reinforcing the message. More emphatic still is this laurel wreath, since laurel is a symbol of the resurrection. That wreath is a mixture, then, of pagan and christian symbolism (the banner reads 'Thy will be done'). However, the fashion for all things Egyptian and a desire to avoid religious controversy saw some defiantly unchristian symbols such as the obelisk, another representative of eternal life. 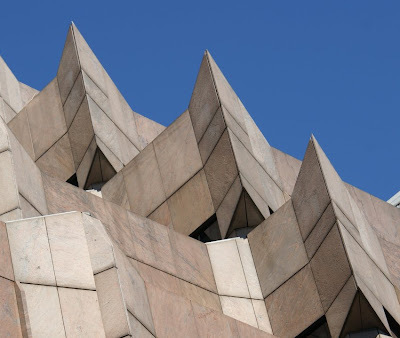 According to legend, its pointy top also stopped the devil reclining on the grave. On a smaller scale, ivy often appears on graves: it is evergreen; its clinging nature was compared to humanity's need for divine support; and its ability to survive on dead wood suggested the immortal soul surviving after the body had died. In Nunhead, the references to eternal life are almost all specifically christian. However, there is something very Victorian about the way that they are made using a wide range of symbols, many very pagan indeed. This post, originally published last December, has been updated with more information about the memorial stone. He had travelled from the South Pacific with Captain Bligh, most famous for being subjected to mutiny on the Bounty, his previous ship. Less well-known is that the purpose of Bligh's journey was to obtain breadfruit plants, with the idea that they could be grown in the Caribbean to feed slaves cheaply. At the time, the islands could not produce sufficient food for their inhabitants, and it had to be exported expensively from North America - particularly difficult now the American War of Independence was underway. 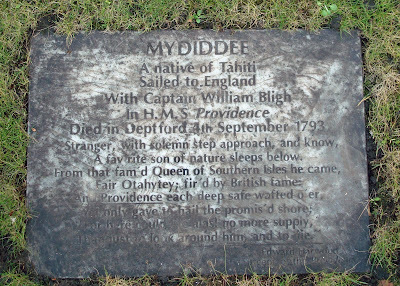 Bligh returned from the second breadfruit expedition on HMS Providence with the plants, and with Mydiddee. Interestingly, it reflects many of the preoccupations of the era and the voyage (although telling us virtually nothing about Mydiddee himself): the idea of the 'noble savage' or 'son of nature' promoted by Romantics such as Rousseau; British national and naval pride; and the smaller theme of yet again emphasising that it wasn't 'safe' Providence that killed him. Further reading: Rosemary Hunter, 'Surviving the Pacific' 1(2) Pacific Island Focus 23. I've just bought a Victorian book, Nathan Dews' The History of Deptford, in the Counties of Kent and Surrey, Compiled From Authentic Records. It is dedicated to William John Evelyn, whose portrait appears as the frontispiece: a marvellously-moustached Victorian gentleman. Dews' choice of dedication was perhaps an astute one, since William was not just a descendant of the more famous John Evelyn (diarist, contemporary of Pepys and resident of Sayes Court). 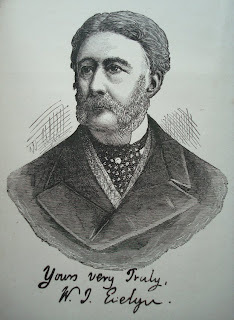 He would also become Deptford's MP two years later, although only for three years: he resigned the seat in 1888. William Evelyn's resignation was the result of events in Mitchelstown, Ireland where police shot on protestors and killed three people. Subsequently the government accepted the police version of events and refuse to condemn their actions; Evelyn was horrified by this and resigned from parliament. The by-election which followed would be contested by his good friend Wilfred Scawen Blunt from an Irish prison. Evelyn now settled down to life in his country home, Wotton House in Dorking, Surrey. His ancestor John Evelyn's grandfather had bought it, and John - a youngest son - grew up here before leaving for London. William updated the house with a Victorian Gothic facade, created gardens, and established a small menagerie including kangaroos, a zebra, chameleons and a seagull. For a while, the kangaroos lived loose on Leith Hill - no doubt startling many passers-by! In Nunhead Cemetery, it is hard to avoid one symbol of life's ending. A downturned torch, representing the snuffing-out of life, can be seen on the cemetery gates as well as many of its graves. However, there were plenty of other ways in which the Victorians could symbolise the cutting short of a life. Broken columns and cut flowers were popular, their meaning straightforward. More obscure is the cloth draped across an urn. Although at this time cremation was illegal, the symbol harked back to Classical traditions. The urn was thus a cremation urn, with a funeral pall lying over it. It also served as a symbol for the body as vessel for the soul. Why a Greek or Roman symbol in an overwhelmingly Christian cemetery? Because for some Anglicans and non-conformists, it avoided any suspicion of Popery (unlike angels, saints and the cross). This use of Classical themes would eventually be attacked by Gothic Revivalists, who saw them as pagan and unsuitable for Christian use. Fashion changed once again, to favour symbols of eternal life rather than these representations of mortal death. An open day at the weekend was just the prompt I needed to visit Nunhead Cemetery. One of the 'magnificent seven' created in nineteenth-century London, it may be less famous than siblings such as Highgate but is pretty amazing all the same. The creation of a more sanitary city in the nineteenth century involved many innovations. Some, such as the sewage system, are obvious ways to improve health; others may be less so. Today, the City's churchyards offer few clues to their former overcrowded condition. Indeed, they were so unpleasant and unhealthy that Parliament encouraged the creation of seven new cemetries in a circle around the edges of the city. One of these was Nunhead, opened in 1840. 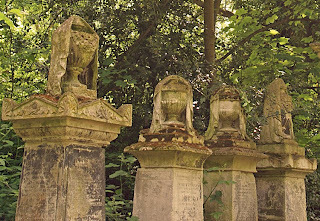 The cemetery owners, the London Cemetery Company, had established Highgate Cemetery the previous year. Unfortunately, there would be scandal in 1865 when the company secretary was found to have embezzled £18,000 - nonetheless, he was buried in Nunhead. The company absorbed the losses and continued to thrive throughout the Victorian period. However, business became harder after the First World War as costs rose and funeral expenditure fell. Nunhead declined badly after World War II and was abandoned by its owners in 1969. Gradually, woodland took over and wildlife moved in. Finally, Southwark Council paid £1 for the cemetery in 1976; restoration has been carried out by Nunhead's Friends. A quarter of a million people are buried here. Many have no grave markers - mostly because they were placed in common graves, but sometimes because the memorials have suffered and decayed over the decades. However, those which survive are rich in Victorian style, and demonstrate a wide range of nineteenth-century symbolism: a topic I'll return to in future posts. Victorian culture was diverse and innovative: these selection can serve as no more than a very small sample. Self-improvement was an important theme, whether in working people's institutes or in grand museums. An expanding city and a belief in healthy fresh air and exercise contributed to the development of the city's parks, while at night the capital offered an enormous range of entertainments from the rowdy music hall to the more refined theatre. One event dominates - the Great Exhibition of 1851 was quintessentially Victorian in its combination of technological innovation, arts and commerce, imperialism, and educational opportunities - all jostling with offers of novelty, wonder and awed admiration. Sadly, the Crystal Palace is gone and its exhibits scattered or lost - but its mark on the capital remains, most notably in two of the three locations here. of the Great Exhibition of 1851, 1854, from Wikipedia. The profits of the Great Exhibition paid for South Kensington's transformation into a cultural quarter with national museums, Imperial College and the Royal Albert Hall. When the Prince Regent himself died, his memorial was placed here on the southern edge of Hyde Park. Even without going in to the museums - all free - it's hard not to be impressed by the Victorian splendour of the Natural History Museum designed by Waterhouse or Henry Cole's Victoria & Albert Museum - where I'd particularly recommend the cast galleries, which are strange, splendid and a record of one way the Victorians learned about the wider world. Walk up Exhibition Road and you'll also see Imperial College and the splendid Royal Albert Hall, as well as smaller gems like the Royal College of Organists. 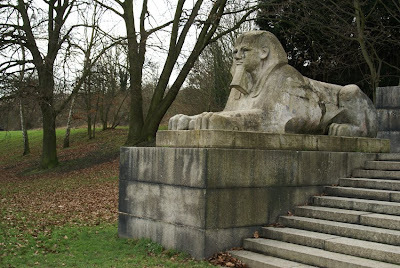 As well as its famous dinosaurs, Crystal Palace Park had a range of attractions, not all so improving in nature. After the Great Exhibition, the Palace was moved here in 1854 and became an exhibition centre, with events often spilling out into its grounds. They were aimed at the wider population, and the venue became known as the 'Palace of the People'. Millions came each year to shows, exhibitions, sporting events, concerts, huge meetings of societies ranging from athletes to the National Temperance League, and weekly firework displays. Although popular in both senses of the word, Crystal Palace was also regularly visited by the royal family. Thanks to a devastating fire in 1936, the palace is gone; much of the park has been given over to the National Sports Centre. However, you can see the terraces where the palace once stood; wander through the lesson in evolution and geology that is the Dinosaur Court; and get lost in the recently-restored maze. Finally, don't miss the museum. The museums may have been wholly and the parks partly improving, but pub music halls were pure fun. Unfortunately, many closed in the 1880s - health and safety regulations had an impact even then. Indeed, only one of these buildings now survives - the wonderful Wilton's which I've posted on in detail here. It makes a fascinating contrast to the other sites: one couldn't imagine the royal family dropping in to watch a show! Also worth seeing: London's many Victorian theatres, the National Portrait Gallery (which is conveniently tucked right behind the National Gallery), Highgate Cemetery - a popular place for family walks as well as a graveyard. 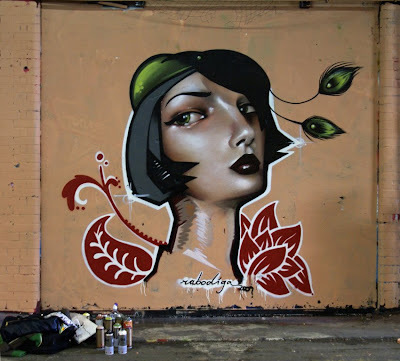 For more London highlights, click here. 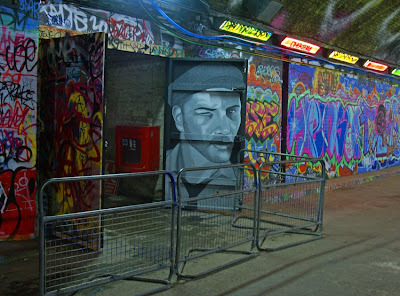 Yesterday, I mentioned emerging from Tunnel 228 into the Leake Street tunnel. 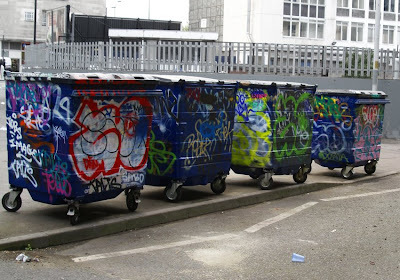 This passage near Waterloo was the venue for Banksy's Cans Festival last year, and has now become a more-or-less permanent site for graffiti and street art - with works constantly changing. Here are some I photographed on Friday. A website for Track & Rail Cleaning Ltd, a map and a timeslot: the Tunnel 228 project wasn't giving much away. Luckily, I signed up anyway before all the tickets ran out. Walking into the unknown, ticket inspected, hand stamped and mask donned, was hardly reassuring. The event is a mixture of theatre and art exhibition, a collaboration between Punchdrunk, specialists in 'immersive theatre', the Old Vic's Kevin Spacey, and a number of artists. 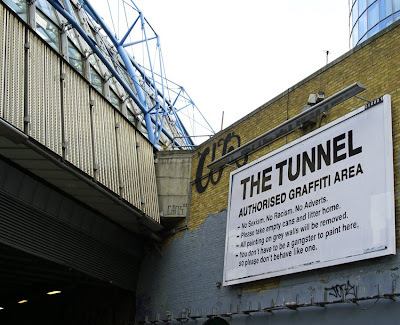 It all takes place in a tunnel under Waterloo Station. Inspired by Fritz Lang's 1927 silent film Metropolis, there are also overtones of 1984 and Edgar Allen Poe. The compulsory face mask worn by all visitors adds a topically apocalyptic note. However, in the corners and side rooms are pieces of art: a paper forest whose paper moths stream towards the light, tiny city scenes with bingo halls and petrol stations, sinister objects such as a coffin filled with baby birds, and slumped, immobile bodies. 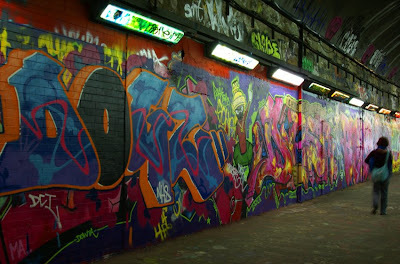 On leaving this environment, the spell is not immediately broken: the door leads into the Leake Street tunnel, its walls vivid with graffiti. The visitor steps out holding a book of the project, which suggests an opportunity to reflect upon a strangely absorbing, unsettling experience. A journey can be as interesting as the destination, especially when it involves passing through somewhere unexpected like Battersea Park Station. As I hadn't been here before, stepping off the platform into the station building was quite a surprise: despite the best efforts of the rail operators to distract passengers with an overlay of garish plastic, the ticket office area is defiantly Victorian. Recent plans to redevelop the station involve restoration of this ticket hall, which is Grade II listed. 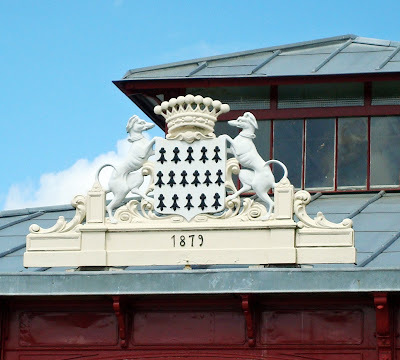 The station was built in the mid-1860s for the London, Brighton & South Coast Railway, who have also left their mark on the railway bridge just outside. 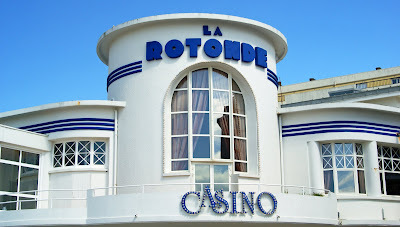 The roundels represent (clockwise from top) London, the Cinque Ports, Brighton and Portsmouth. However, they are something of a misrepresentation here since Battersea Park served only the South London Line between Victoria and London Bridge. Forced to compete with trams, the railway became electrified in 1909 - with power supplied by Deptford power station. Rather like the Cenotaph, the Monument impresses by its simplicity: it's a slender doric column topped by a bowl of flames. (Impressive as this golden ornament looks, it was in fact an economy measure: Wren originally planned a statue of Charles II, but that proved too expensive). on three sides of the Pedestal are Inscriptions ... on the other there are proper Stereoglyphick figures carved in Relieve ... the whole of it is a curious piece of Workmanship and cost upwards of 13700 Pounds in Building. 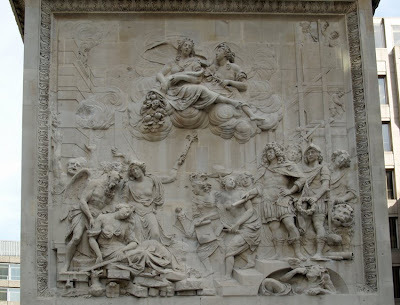 The 'stereoglyphick figures' are indeed rather extraordinary, the work of Caius Gabriel Cibber. Wearing a mixture of contemporary and classical fashions, they pose against billowing flames to the left and the scaffolding of construction works to the right. King Charles II is depicted offering relief to the City, represented allegorically by a languishing woman. In the centre, Plenty and Peace sit on a cloud. The wording is not by Wren but by Dr Gale, master of St Paul's School. The account of the fire was added to in 1681, ending with the words 'But Popish frenzy, which wrought such horrors, is not yet quenched.' This amendment came after the supposed discovery of a Roman Catholic plot by Titus Oates, and was made on the orders of the Court of Common Council and the Court of Aldermen who governed the City. The slanderous words were deleted in 1830, again by order of the Court of Common Council. The tallest freestanding column in the world is more than an elegant memorial, then. It has functioned as an exercise in politics, flattering the King and slandering Catholics as political expediency required. 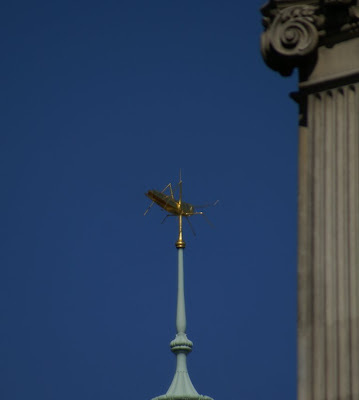 At the same time, it has filled two practical roles: as a tourist attraction which remains popular today, and as a laboratory - although it actually failed in this last purpose as the experiments attempted inside by Wren and his friend Hooke were spoiled by traffic vibrations. There is so much Victoriana in London (and I'm so keen on the period) that I've broken it down into broad subject areas. The first is transport: it was in the nineteenth century that public transport really took off in the city, changing its shape, sounds and roadscapes for ever. Almost too obvious a choice, but it really is unequalled. Buses, rail, tube: all are here, brought to life through original vehicles, photographs, newspapers and ephemera. 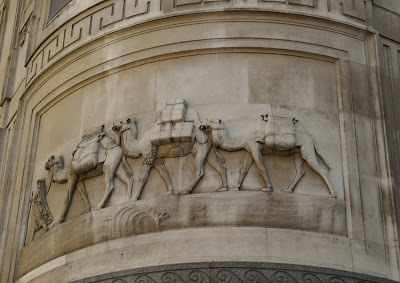 Although the musuem begins its story before the nineteenth century and continues to the present day, it illustrates clearly how much of London's present-day transport system was laid down in the Victorian era with the coming of buses, trams, suburban trains, and the Underground to the capital. This expansion of public transport didn't just change the way we moved around the city, but altered the shape of the city itself. Now, commuting was possible, initially for the middle classes but as fares gradually fell and the tram network expanded, also for the working classes. Euston Road formed the southernmost boundary for train lines entering the city from the north, so Paddington, Marylebone, Euston, St Pancras and King's Cross Stations stretch in a row across the northern edge of the city centre. Of these, the most dramatic is surely St Pancras, a landmark building expressing the confidence and exuberance of Victorian railway companies. More specifically, it towers over neighbouring (historically much busier) King's Cross - the boardroom was carefully placed to look down upon its smaller neighbour. The building facing the street was in fact the Midland Grand Hotel rather than a station building proper; it was originally intended to be even larger, but financial constraints got in the way. When first opened, the hotel was both luxurious and cutting-edge with its ladies' smoking room and lifts. However, by 1935 it had fallen behind the times and was converted into offices and renamed St Pancras Chambers. Behind, the Barlow train shed was the largest enclosed space in the world when it was built in 1868. George Gilbert Scott continued the exuberant Victorian Gothic style here, while an undercroft was used to store beer from Burton on Trent. 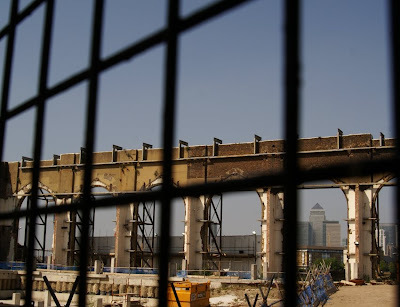 Building the station had required demolition of buildings in Somerstown and Agar Town, the building of a bridge over Regent's Canal, the dismantling of St Luke's church and the relocation of human remains in its graveyard. St Pancras has undergone a renaissance with the arrival of Eurostar. The grandiose red brick building of St Pancras Chambers is to come full circle by being converted back to a hotel once more. While new forms of transport mushroomed in the Victorian city, shipping remained crucial. With ships, of course, came sailors - and catering for them was 'sailortown', a concentration of alehouses, lodging houses, chandleries and shops buying and selling the exotic. Alongside them were sailors' missions, aimed at ministering to and converting the seamen and prostitutes who frequented these areas. Today, the Victorian docks have been transformed through wartime bombing, later obsolescence, and recent regeneration. As a result, the riverside is still rich with physical traces of London's sailing heritage but the atmosphere is more elusive. 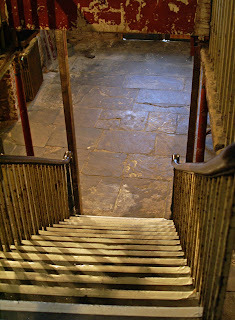 Happily, there is a way to experience something of the nineteenth-century ambience (without the danger): these narrow streets in 1850s Wapping are recreated in the Museum in Docklands. Also worth seeing: the Thames Tunnel (currently closed but due to reopen in 2010) is a still-operational piece of Victorian engineering - designed for horses and wagons carrying ships' cargoes, first used by pedestrians, then the point at which the East London Line crossed under the Thames and now to be part of London Overground. The Embankment was part of Bazalgette's sewage scheme, but its role in transport was integral with a road above and tube lines below. Take the train from London Bridge to Deptford to follow in the tracks of the world's first rail commuters, and the tube from Paddington to Farringdon Road for the first stretch of Tube. Tower Bridge has been both praised and reviled for its mock-mediaeval stone cladding, but however you feel about its looks, watching it open to allow ships to pass is an impressive sight. Given its central place in the city's history, it's unsurprising that the River Thames should be full of archaeological interest. However, as a tidal river it is in constant movement, making the recording of its sites an important and pressing matter. 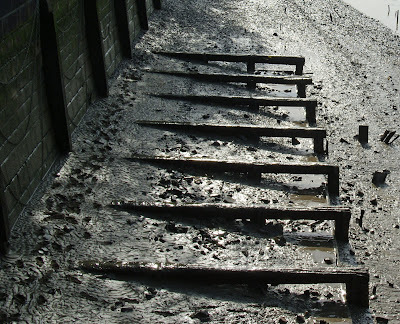 The Thames Discovery Programme is undertaking a major project to do just that, building upon the work of previous surveys. I joined them for a low tide walk along the foreshore below Customs House - on what turned out to be an unusually muddy morning! The foreshore here has especially generous quantities of shells - it's right next to Old Billingsgate Market - as well as bones. On a larger scale, various wooden structures remain along the shore and under the buildings. Chalk was used to make beds for barges to sit upon. This small section of the foreshore extends over three parishes, as indicated by markers on the river wall. 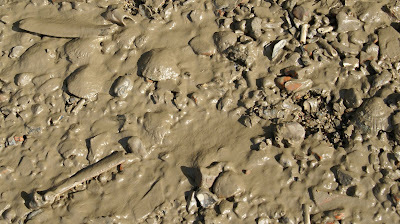 If the thought of a visit to the foreshore appeals (and I'm assured that it's usually a lot less muddy) then check here for further events.